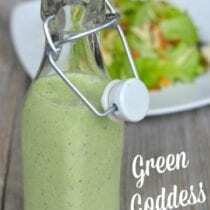 If your salads are getting a little predictable and boring I have the perfect Green Goddess dressing recipe for you to jazz things up! Plus since it’s summertime you can get half the ingredients right out of your herb garden (or from your local farmers’ market). I’ve also discovered this dressing is fabulous in many ways other than just on salad …check out how I used it on a super delicious chicken wrap below, and it’s great as a dip for fresh veggies, too! Puree together in a blender. Serve immediately or refrigerate for up to 4 or 5 days. Shake before each use. Perfect timing! I’m going to make some this weekend. How big of a role do the green onions play as far as taste goes? I see they’re a pretty big portion of the recipe, but I am NOT a fan, so I wonder if it’ll still work without them? The green onions do add a nice punch, are you opposed to chives as an alternative? Or maybe a smaller amount of regular onion? I absolutely love fresh basil so this is perfect for me. Thanks! I got the bottle at Target and knew I’d find some sort of use for it. Too cute to pass up. 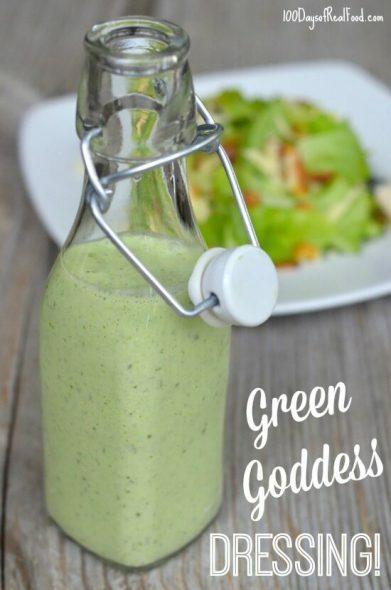 This sounds like a great homemade salad dressing recipe for the summer. This will make way more than I can use in 4-5 days (hubby says he won’t eat it). I wonder if it will freeze ok? I’m thinking the dairy in it will be a problem for freezing. How about making half a recipe? How healthy is this dressing? I haven’t tried it yet but I can tell you that it’s going to taste fantastic. Anytime you balance fresh herbs with some dairy you can a tasty, creamy dressing. I look forward to trying this as a topping on my free range tacos. Cheers! Hi Jane. It makes approximately 12 ounces. What can be substituted for the yogurt? Yogurt and my stomach do not get along. AWESOME! I put some of this dressing on a spinach tortilla with chicken and green apple and it was amazing. Thank you for sharing! We are always looking for a new dressing recipe. This one looks great! Haven’t used yogurt as a base before so it would be fun to try! These comments are for the dressing. 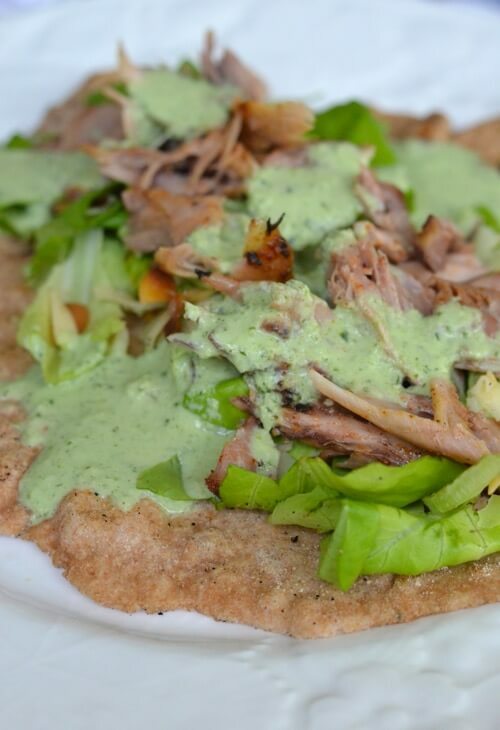 If the wheat tortilla doesn’t work for you, then you can put the dressing on other things! Looks yummy – but isnt whole wheat bad for you and can cause a whole mess of problems such as autoimmune diseases my son is gluten free and all wheat is out thanks! Whole wheat is controversial. It also depends on if you have any illnesses like autoimmune or diabetes or digestive problems. Lisa’s family has no problems with wheat so she uses it. I can’t eat it personally because I am prediabetic and it makes my glucose go too high. I wish I could because it is so versatile! I use wheat to bake for the rest of my family. So, like most things, everyone is different on what they should eat. It’d be great if you’d start putting serving size with your recipes. I know that with Clean Eating that we don’t have to count calories but it’s still important to have portion size. There’s a lot of people out here that don’t know when to stop because our full button isn’t working. It’d be greatly appreciated. And, please, put out another cookbook. Great recipes!!! Hi. This post provides some guidance: https://www.100daysofrealfood.com/2013/01/23/portion-size-matters/. And this gives insight as to why Lisa does not focus on numbers: https://www.100daysofrealfood.com/2013/01/04/healthy-eating-defined/. Is there a way to make this dressing dairy free without the yogurt? Hi. You could try it with a non-dairy yogurt. I do a vegan version using avocado instead of yogurt: Olive oil, lemon juice, lime juice, 1/2 avocado, fresh mint, cilantro & basil, raw tahini and a little salt. If for adults I add some cayenne pepper that has great health benefits too. No garlic needed. Has anyone tried using Greek yogurt instead of whole milk yogurt? I’d image the consistency would be slightly different. Greek yogurt should work fine.